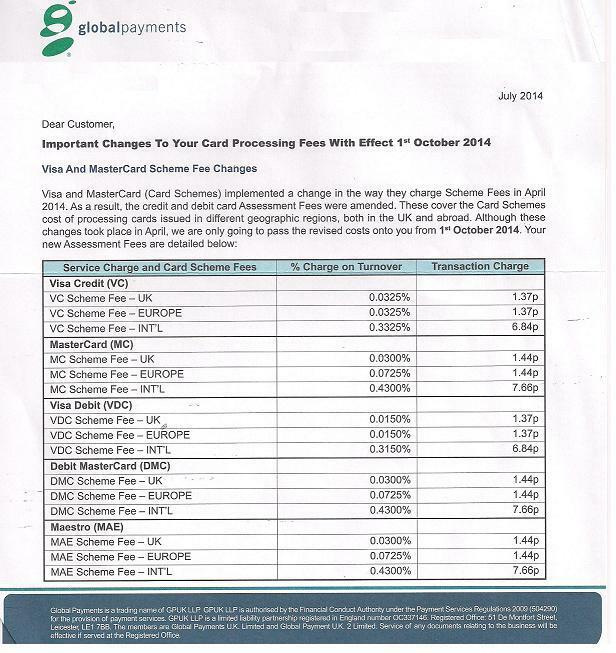 Global Payments customers will have received a letter in July outlining the latest rate increases that will hit them as of 1 October. These latest increases will see the amount of Visa and Mastercard scheme fees passed onto customers increase by up to 124%. To be fair to Global Payments, these increased charges do originate from Visa and Mastercard and are merely being passed on. Where Global Payments customers can lose out in comparison to customers of other merchant acquirers is that whilst Global Payments can easily pass these costs on without too much fuss, other acquirers would need to increase their headline rates. As the risk of upsetting and losing their customers is great, many won’t pass on individual rate increases until their cumulative effect is too great to ignore. You may recall that Global Payment’s fee structure consists of 4 different elements – a processing fee, an interchange differential fee, a scheme fee and an authorisation fee (see Understanding your Global Payments Merchant Account Statement). Other acquirers will give customer’s just one rate – the “all-inclusive rate”. What do the increases mean for me ? A typical Global Payment’s debit fee will consist of say a 12p processing fee, a 2.95p authorisation fee and a 1.2p scheme fee, giving a total cost of 16.15p per debit transaction. The impact of the October changes will increase the scheme fee element on a typical £50 UK debit transaction to 2.1p (Visa) and 2.9p (Mastercard). Thus a debit transaction will now cost 17p – 18p which represents a 5% – 10% increase on the total cost of debit acceptance for UK issued debit cards, depending on whether they are Visa or Mastercard. The impact on cards issued outwith the EU is even greater. Again taking a typical £50 Visa debit transaction, these already attract a scheme fee component of 10.7p, and would cost a total of 25.65p (vs. 16.15p for a UK issued Visa debit card). The October price changes will increase the scheme fee component to 22.6p taking the total cost to 37.55p, representing an increase of 46% on the total cost of accepting a Visa debit international card. What can I do about these increases ? Given the increases arise from increased costs to Global Payments, it is unlikely that a complaint or threat to take your business elsewhere will elicit a positive response. The only way to avoid increased charges is to switch providers. Not all acquirers will pass on these scheme fee increases and you may find that there are other savings over and above avoidance of scheme fee increases. At Cardswitcher we are more than happy to provide you with a free, detailed, side by side comparison of your current fees vs. our best alternative quote. Simply upload your latest merchant account statement using the form below.